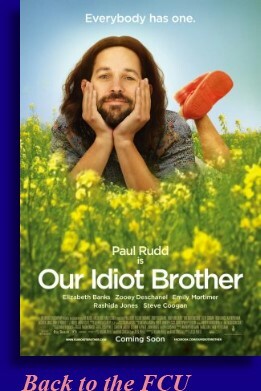 Ned Rochlin (Paul Rudd) is an idiot. No denying that. We often observe the matriarch of the Rochlin family (Shirley Knight) enjoying a glass of wine, intimating that the woman might have a bit of a drinking problem, and after meeting Ned and his three sisters we see clearly through Ms. Rochlin’s offspring that Fetal Alcohol Syndrome is real. Also while looking at the Rochlin kids, we think they also had four different babies daddies since none of them look even remotely alike. We know it’s a movie and they aren’t related for real, but these four actors do look like they come from four different corners of the earth. But the movie is about Ned and not his sisters, thus the name of the movie is ‘Our Idiot Brother’ and not ‘My Extremely Bitchy, distasteful, albeit good looking Sisters’ because we probably wouldn’t have watched the movie if it was called that. Even though that title is pretty spot on. So when Ned gets out of the clink in a few months, for good behavior of course, he finds his life is a little upside down. His girlfriend (Kathryn Hahn) has kicked him out of the homestead, kept his dog, and moved in a brand new idiot (T.J. Miller). Thus with nowhere else to go, Ned decides to take up with his sisters though none of them really want to step up to the plate and do this, despite the fact that Ned seems like such a wonderful person. First he moves in with Liz (Emily Mortimer), a shrinking violent being mentally abused by her husband (Steve Coogan) who just happens to be having an affair with the subject of some documentary film he’s making. After Ned accidentally injures their six year old son, while being an idiot mind you, he’s got to go. slipped her some sodium pentothal. That’s a good thing, until something happens and Ned refused to help his sister out, because it would’ve been the wrong thing to do. Ned also kind of messes up her relationship with her assistant (Adam Scott), now Ned’s gotta go. Now Ned has to stay with his sister Natalie (Zooey Deschanel), who I think is a stand-up comic… I think. Natalie is a lesbian, kind of, living with her true love Cindy. Cindy is played by Rashida Jones and the filmmakers did their best to make the ultra-feminine Ms. Jones look aggressively butch and unattractive in this movie. They failed at that. Thing is Natalie ends up pregnant. Cindy kinda wasn’t the one who knocked her up, just in case you skipped that lesson in Biology class. Natalie would like for Cindy not to find out about this. That doesn’t happen because of Ned. Ned has gotta go. I gotta be honest with you. I really didn’t care for ‘Our Idiot Brother’, and I’m a little surprised by this. I imagined before watching it that I would probably enjoy it based on the cast alone, and at worst I thought I’d be indifferent towards it, but I didn’t expect to flat out not like it. I mean Paul Rudd can play this role in his sleep, Emily Mortimer is bewitching, Zooey Deschanel is enchanting, Elizabeth Banks is radiant and Steve Coogan is a funny dude, but this movie, labeling itself as a comedy just wasn’t all that funny. In fact, this a fairly mean spirited movie, filled with a lot of mean spirited people doing a lot of mean spirited things… and cursing. I mean I can let the profanities fly with the best of them, but when f-bombs get to the level that even I start getting a little uncomfortable, it may be time to peel it back a tad. Once the eleven year old dropped an f-bomb… I’m just saying is all. So while we supposed we were going to get a nice predictable feel good movie with ‘Our Idiot Brother’, we got a not so nice, kind of downer but still predictable movie with ‘Our Idiot Brother’. Maybe it was supposed to be a dark comedy? Regardless, whatever comedy that was supposed to be there was lost on me.